Hello everyone! I hope you are having a great day so far! If you read my blog, I think you might still remember the flare skirt in the previous post. 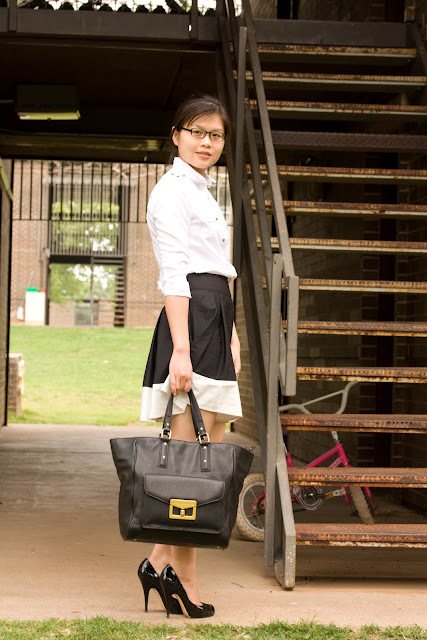 Today, I revisited and paired it with my white blouse to create a casual business outfit. Thank you for reading! Have a wonderful week ahead! Like how you've made the fun skirt into casual business outfit. Love those shoes! I really like this outfit! And i'm in love with your skirt!! Maybe we can follow each other, for keap in touch?? Thank you for leaving the nice comments! This is hands down my favorite look of yours! Love it! I am always a fan of white blouses and your skirt is just lovely!! !